We’d love your help. Let us know what’s wrong with this preview of The Steel Spring by Per Wahlöö. Recovering in a hospital room abroad after a liver transplant, Jensen receives a note instructing him to return Chief Inspector Jensen is a policeman in an unnamed European country where the government has criminalized being drunk, where newspapers are designed for reassurance, and where the city centers have been demolished to devote more space to gleaming new highways. To ask other readers questions about The Steel Spring, please sign up. THE STEEL SPRING. (1968; trans. 2002). Per Wahloo. ****1/2. Per Wahloo and his wife, Maj Sjowall, were Swedish writers who, together wrote the police procedurals featuring police commissioner Martin Beck. These were extremely popular in the late 1960s and early 1970s. The fourth novel in the series, “The Laughing Policeman,” won the Edgar Award for best novel in 1971. If you are looking for the precursors to the current lineup of Scandinavian writers of crime fiction, look no further. They were e THE STEEL SPRING. (1968; trans. 2002). Per Wahloo. ****1/2. Per Wahloo and his wife, Maj Sjowall, were Swedish writers who, together wrote the police procedurals featuring police commissioner Martin Beck. These were extremely popular in the late 1960s and early 1970s. The fourth novel in the series, “The Laughing Policeman,” won the Edgar Award for best novel in 1971. If you are looking for the precursors to the current lineup of Scandinavian writers of crime fiction, look no further. They were excellent crime novels. This novel was a stand-alone, and not part of the series. I was not aware that Per had written novels on his own right, but apparently he did. I’ve checked at Amazon and learned, to my dismay, that copies are not all that available in translation. If the untranslated copies are anything like this one, we are missing out on some pretty damned good writing. This novel is a crime novel on a global scale that takes place in a dystopian country. It’s pretty easy to classify this novel. It is a mystery; a psychological novel; a science fiction work, and probably a few other classes. The opening of the book is probably one of the best pieces of suspense writing that I have come across in years. I can’t say much about the plot, but if you remember your Lord Acton quotes you will have a pretty good idea. I highly recommend this novel. The first two-thirds of this novel were masterful and understated. Wahloo's end-of-the-world (or rather end-of-a-country) scenario was realistic and even laconically artistic, but most importantly, not at all melodramatic or hyperbolic or silly. Unfortunately, the final third of the book comes to a standstill of rather dull and unnecessary exposition. Imagine if Cormac McCarthy had explained everything to us in The Road. Or if Wittgenstein's Mistress would have had a "revealing" epilogue. Now I The first two-thirds of this novel were masterful and understated. Wahloo's end-of-the-world (or rather end-of-a-country) scenario was realistic and even laconically artistic, but most importantly, not at all melodramatic or hyperbolic or silly. Unfortunately, the final third of the book comes to a standstill of rather dull and unnecessary exposition. Imagine if Cormac McCarthy had explained everything to us in The Road. Or if Wittgenstein's Mistress would have had a "revealing" epilogue. Per Wahloo è un grande della letteratura gialla, probabilmente il papà di tutti quei fenomeni scandinavi che si aggirano oggi per le nostre librerie, però a volte anche i grandi sbagliano. Ecco, questo è uno di quei casi. Trama debole debole e assolutamente surreale, commissario inesistente, poco pathos e finale ridicolo. Capita! Odd structure, lots (and lots) of talking. I've read the whole Martin Beck series several times over so the dystopian elements would have caught me off guard if I hadn't read a previous review here. A weird dystopian warning of a novel, about the error of trying to control your population. The Steel Spring is a heavy-handed lesson in why you can't write from a theme as opposed to a story. Per Wahloo was an avowed Marxist and has attempted a Marxist critique of a future Sweden (though the country is unnamed in the novel), based on the not unreasonable concept that the liberal Social Democrats have combined with the trade unions to exploit the workers for capitalist benefit. The result is a dystopian society prefiguring what has now become the sandbox of YA novels and Hollywood film The Steel Spring is a heavy-handed lesson in why you can't write from a theme as opposed to a story. Per Wahloo was an avowed Marxist and has attempted a Marxist critique of a future Sweden (though the country is unnamed in the novel), based on the not unreasonable concept that the liberal Social Democrats have combined with the trade unions to exploit the workers for capitalist benefit. The result is a dystopian society prefiguring what has now become the sandbox of YA novels and Hollywood films. It's about as compelling as those socialist realist novels cranked out under Stalin. Here, Wahloo creates a dunderhead of a detective who's incapable of understanding evidence or solving a case and whose main function is to ask repetitive questions of two other characters who happen to understand what's happened for the last 75% of the novel. So we have lots of "And then what happened?" Comprato solo per il titolo (se c'è una epidemia nel titolo o nella trama difficilmente resisto, indipendentemente dal tipo di epidemia), senza prima indagare su chi fosse l'autore o se il volume in questione facesse parte o meno di una serie. Solitamente tendo a prendere gli autori nordici con le pinze, dopo varie letture inzio a trovarli poco attraenti, ma il titolo, come già detto, ha fatto da specchietto. Fortunatamente è solo il secondo di una serie di due titoli - il primo è Delitto al trent Comprato solo per il titolo (se c'è una epidemia nel titolo o nella trama difficilmente resisto, indipendentemente dal tipo di epidemia), senza prima indagare su chi fosse l'autore o se il volume in questione facesse parte o meno di una serie. Fortunatamente è solo il secondo di una serie di due titoli - il primo è Delitto al trentunesimo piano - ma non so se la cosa potrebbe istigarmi a leggere il primo capitolo della storia dell'Ispettore Jensen. Il paese, mai nominato (ma si presuppone la Svezia), è ben descritto nella sua politica e nelle abitudini anche nel secondo volume e, nella sua essenza di thriller fantapolitico, non mi icnuriosisce al punto da approfondire la storia. Tutto, epidemia compresa, sembra solo una scusa per criticare un certo modo di fare politica o di gestire i problemi sociali che, da quanto letto in altri romanzi di autori nordici, non è poi così distante dalla realtà dei fatti. Solo un filo più estremi che nella nostra attualità. Seguire le vicende personali di Jensen è fastidioso, per l'antipatia di quasi tutti i personaggi più che per il probabile futuro mostrato e, in questo caso, non posso neppure dare la colpa al fatto che il romanzo possa essere datato (che mi sono accorta molto dopo che era stato scritto nel '68), visto che la situazione ucronica (ma forse è troppo definirla così) potrebbe essere ancora possibile e non è stata sconfessata dall'evoluzione della socità presa in esame dallo scrittore. Si trappa proprio di un romanzo che descrive poco e lascia ancora meno. La seconda stelletta è solo per l'epidemia che, sotto sotto, è stata gestita in maniera originale per quanto riguarda la sua genesi. This was the last novel that Per Wahloo wrote on his own. (see Fantastic Fiction) All the later ones, the last six in the ten title Martin Beck series, were written in partnership with Maj Sjowal. 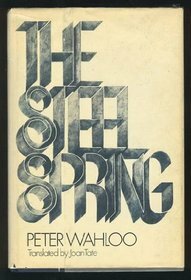 THE STEEL SPRING is the only one of his stand-alone novels that I have read so far, although I have some more on my radar. Although crimes have obviously been committed, the plot is not really crime fiction, but rather is dystopian, emerging from his Marxist-based vision of where Swedish society is head This was the last novel that Per Wahloo wrote on his own. (see Fantastic Fiction) All the later ones, the last six in the ten title Martin Beck series, were written in partnership with Maj Sjowal. THE STEEL SPRING is the only one of his stand-alone novels that I have read so far, although I have some more on my radar. Although crimes have obviously been committed, the plot is not really crime fiction, but rather is dystopian, emerging from his Marxist-based vision of where Swedish society is headed. It is heavily infused with disillusionment and scary messages. In contrast to other dystopian novels that I have read, it is not a world apocalypse that will destroy Sweden, but rather it will self-combust. He does not name Sweden in the novel, probably to escape some sort of prosecution, but every one who read the novel at the time would know which country he was referring to. Hakan Nesser uses a similar ploy in his novels set in an unnamed Scandinavian country, although I don't think his have the political overtones of THE STEEL SPRING (and perhaps others by Per Wahloo). When I saw The Steel Spring in a bookshop and noticed that it was written by a co-author of the Martin Beck crime series, I snapped it up. Set in an unnamed country, the novel centres on Inspector Jensen, a patient who is about to go abroad for a transplant operation. His last official act before leaving is to issue warrants for the arrest of a number of doctors, including his own. When Jensen recovers, he is contacted by some government figures who advise him that there is something mysterious g When I saw The Steel Spring in a bookshop and noticed that it was written by a co-author of the Martin Beck crime series, I snapped it up. When Jensen recovers, he is contacted by some government figures who advise him that there is something mysterious going on at home and communications are down. They order him to go back to find out what is going on, and report back. When he returns, Jensen soon discovers that the country seems to be in the grip of a massive epidemic, and society is falling apart. This book was extremely creepy, a good balance between post-apocalyptic tale and detective novel. Because the author has been dead for more than 3 decades, some of the political topics mentioned are very dated. But it is still a well-written thriller and the author is a master at building up tension while revealing just enough to keep us hooked. Продолжение "Гибели 31 отдела". Просится к экранизации. Страна в хаосе, все коммуникации оборваны, политики сбежали. Говорят, что свирепствует эпидемия, но достоверно никому ничего не известно. Интрига! This was first published in 1968 and like "Murder on the thirty-first floor" features Inspector Jensen. Like the previous book this is more like science fiction than detective fiction though Jensen is a really dogged detective. This is a grim story though there is hope at the end. Descrizioni Troppo lunghe. Pensavo fosse un genere di libro Totalmente differente. Tutto sommato è stato scorrevole. Had a promising beginning but never really went anywhere. I read all books by one or both of these authors years ago and loved every one. This book was different to what I had expected when told it had a policeman as a main character. I enjoyed and read it quickly. Per Fredrik Wahlöö (5 August 1926 - 22 June 1975) was a Swedish author. He is perhaps best known for the collaborative work with his partner Maj Sjöwall on a series of ten novels about the exploits of Martin Beck, a police detective in Stockholm, published between 1965 and 1975. In 1971, The Laughing Policeman (a translation of Den skrattande polisen, originally published in 1968) won an Edgar Awa Per Fredrik Wahlöö (5 August 1926 - 22 June 1975) was a Swedish author. He is perhaps best known for the collaborative work with his partner Maj Sjöwall on a series of ten novels about the exploits of Martin Beck, a police detective in Stockholm, published between 1965 and 1975. In 1971, The Laughing Policeman (a translation of Den skrattande polisen, originally published in 1968) won an Edgar Award from the Mystery Writers of America for Best Novel. Wahlöö and Sjöwall also wrote novels separately.